This small batch of chokecherry jelly uses only one pound of foraged chokecherries. 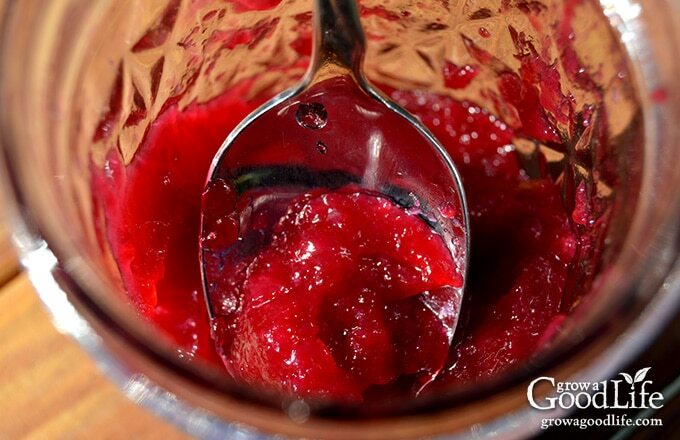 It is a perfect balance of tart and sweet resulting in a jelly that tastes delicious on homemade bread and pairs well with poultry dishes. The natural range of the common Chokecherry (Prunus virginiana) tree includes much of southern Canada and northern United States. 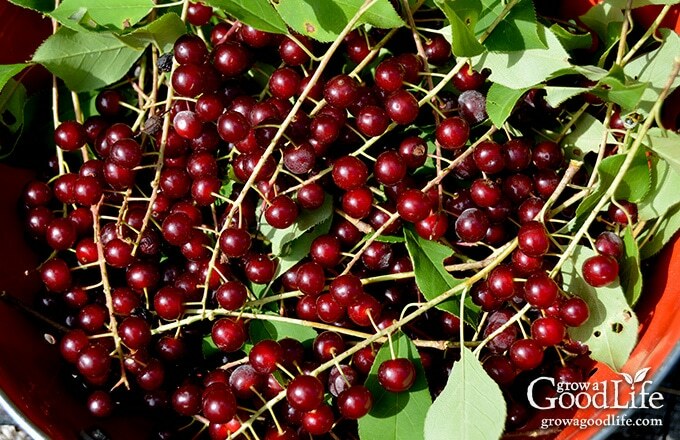 The chokecherry is adaptable and reproduces by seed and underground rhizomes. It is often found growing in groups in forests, along edges of woods, fencerows, edges of the road, and stream banks. We had a stand of chokecherry trees on our property when I was growing up. It was rumored that a neighbor would painstakingly harvest gallons of ripe chokecherries every year and transform them into homemade wine, but that was well before my time. No one made use of this foraged fruit while I was growing up. All I remember is childhood dares on how many chokecherries we could eat before our mouths turned numb. We knew the risks, if we ate too many, we would have a stomachache for days. We also would spit out the pits because we were told they were poisonous, and we listened to our elders. After all, none of us wanted to die young. Our mothers cursed the chokecherries as we used the ripe fruit as weapons of opportunity in our make believe wars as we stripped the fruit from the trees and flung them like tiny grenades towards our opponent showering their clothing with bright red stains as the fruit made contact. I was an adult when I tasted my first sample of chokecherry jelly. It was delicious, both sweet and tart at the same time. The flavor is very similar to cranberry sauce. I was so excited when I found a few chokecherry trees behind the shed on our property and couldn’t wait to try making jelly. Chokecherry trees are easy to identify. The leaves are oval shaped, slightly pointed at the tip, and finely edged with serrated teeth. The color is dark green and shiny on top and pale and dull underneath. The flowers appear in late spring after the tree has leafed out. The white blossoms grow on racemes, or an elongated flower cluster with the separate flowers attached with stalks to a central stem. 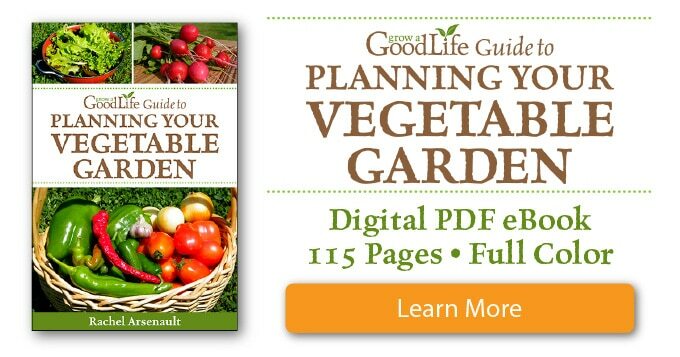 Each flower produces a single-seeded red berry that turns dark red-purple when ripe. The berries are pea sized and have a very astringent, sour taste. Ideal harvest time is usually in August through September in my area. 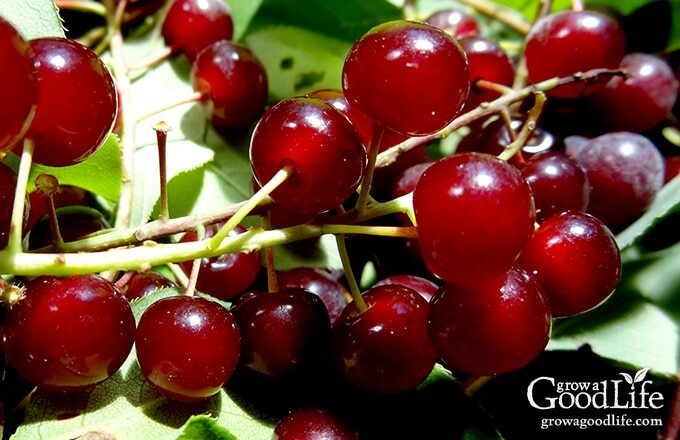 More tips on how to identify chokecherries plus pictures here. I spotted the familiar blossoms in the spring several years ago in an overgrown section of our property behind our shed. I checked on the chokecherries in August and saw many clusters of the red fruit. I remember waiting patiently for the fruit to ripen from red to a deep burgundy that first year because I knew they would taste a little less astringent. I wasn’t the only one watching and waiting for the most opportune time. Unfortunately, the birds got to the chokecherries first and ate them all leaving only empty stems behind. Even this year as I climbed a ladder to pluck the chokecherry branches from the tree, I had to contend with several robins that stopped by for a mid-morning snack. They landed on the branches near me to dine on the ripe fruit. I don’t think they realized I was there at first, as they seemed suddenly startled by my presence and flew off in a panic to the trees nearby. The robins scolded me from the safety of the trees the entire time I was there. I gathered as many of the chokecherries from the bottom limbs and left the rest for the birds. 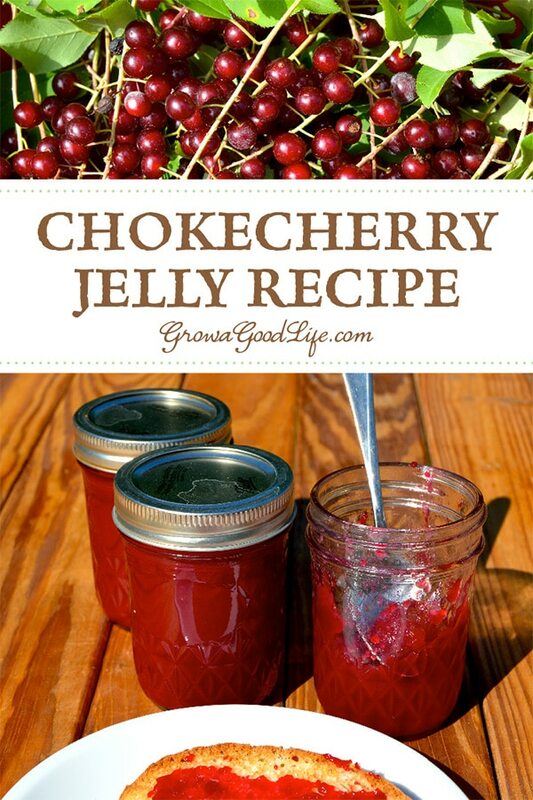 I have tried different chokecherry jelly methods over the last few years. 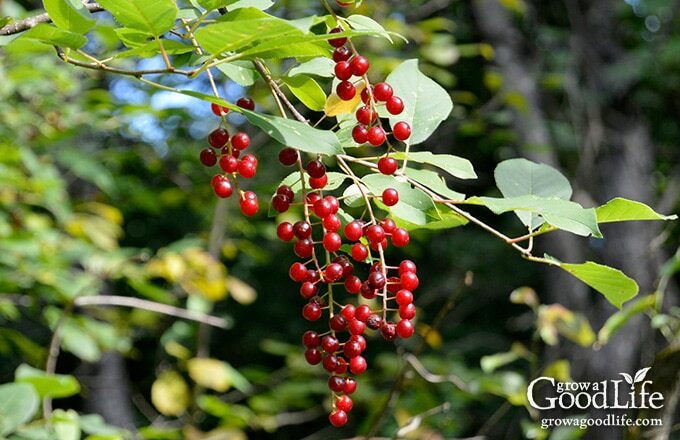 The grove of chokecherry trees on our property is small and yields only a limited amount of fruit. I only have one chance each season to try to make a small batch of jelly. I have ended up with syrup many times. Since chokecherries have some natural pectin, I first experimented with making jelly using no pectin. It took a long time of boiling and I ended up with very little jelly for my efforts. The next experiment using boxed pectin resulted in a nice chokecherry jelly, but it was too sweet for my taste. Finally, I found a recipe for chokecherry jelly on the Pomona’s Pectin website and never looked back. It always gels and is a perfect balance of sweet and tart flavor. Plus you can scale the recipe easily depending on how much fruit you have gathered. 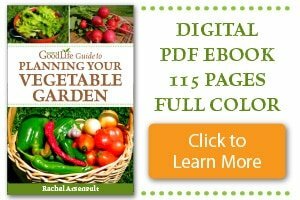 This recipe is adapted from the Pamona’s Pectin website. Get Pamona’s Pectin on Amazon. Plus basic kitchen supplies such as a large sauce pot, small pot, towels, potato masher, measuring cup. 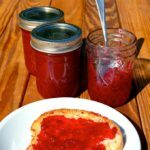 This chokecherry jelly is the perfect balance of tart and sweet resulting in a jelly that tastes delicious on homemade bread and pairs well with poultry dishes. Prepare your calcium water ahead of time by combining 1/2 teaspoon calcium powder with 1/2 cup water in a small, clear jar with a lid. Shake well. Store extra in the refrigerator. Wash the chokecherries plain water and extract the juice by combining the fruit and water in a large saucepan. Bring to a boil over medium-high heat then reduce to a simmer over low heat. Gently mash the chokecherries with a potato masher to release their juices and continue simmering over low heat for 30 minutes, stirring occasionally. Strain through a damp jelly bag or double layers of cheesecloth. Allow the chokecherries to strain for several hours, or overnight. Chokecherry juice is not clear, so feel free to squeeze the bag a squeeze to press out all the delicious juice. Discard solids. Remember the seeds are toxic, so toss the solids into the trash rather than composting if you have livestock that has access to your compost bins. Prepare your jars and lids by washing in warm, soapy water and rinsing thoroughly. Place jar rack into water bath canner, set jars in the canner, add water, and boil jars for 10 minutes to sterilize. Warm your lids in a small pot over low heat. Keep jars and lids warm until ready to use. In a small bowl, add sugar, pectin powder, and stir to blend together. Set aside. Measure out 2 cups of chokecherry juice (add water if needed) and pour into a saucepan. Add calcium water and lemon juice and stir to mix well. Bring juice to a boil over medium-high heat. Add the pectin-sugar mixture and stir to dissolve. Continue stirring until the jelly comes back to a boil. Once it boils, remove from heat and skim off foam. Spread kitchen towel on the counter. Use your jar lifter to remove warm jars from canner, drain, and line up on the towel. 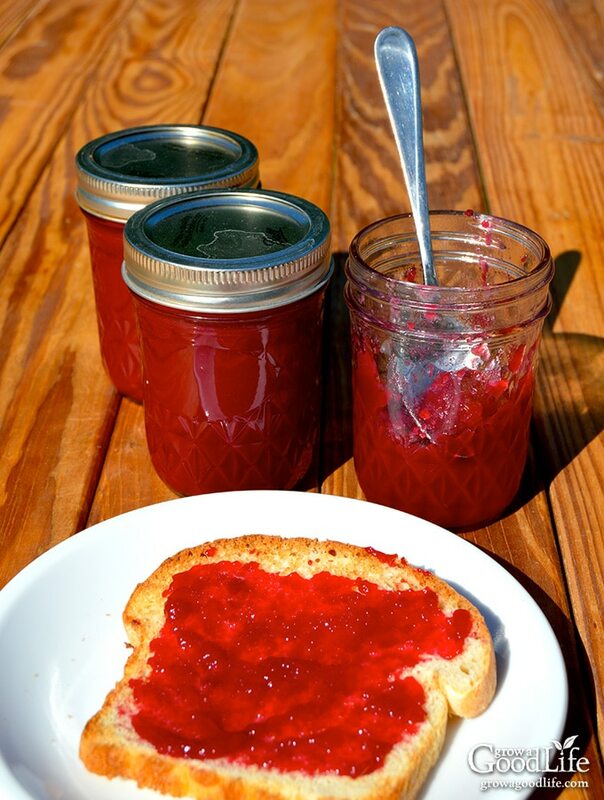 Use your canning ladle and funnel and add the chokecherry jelly to warm jars leaving 1/4-inch headspace. Wipe the rims. Use your magnetic lid lifter to lift lids out of the warm water, center lid on the jar, and screw on band until it is fingertip tight. Using jar lifter, place jars carefully into canner leaving space in between them. Once jars are all in canner, adjust the water level so it is at least one inch above the jar tops. Add more boiling water if needed so the water level is at least one inch above the jar tops. When adding water, use the hot water from the small pot your lids were in. Pour the water around the jars and not directly onto them. Cover the canner and bring to boil over high heat. Once water boils vigorously, continue boiling for 10 minutes at altitudes of less than 1,000 ft. (adjust processing time for your altitude if necessary). After 12 to 24-hours, check to be sure jar lids have sealed by pushing on the center of the lid. The lid should not pop up. If the lid flexes up and down, it did not seal. Refrigerate the jar and use up within a few weeks. Remove the screw on bands and wash the jars. Label and date the jars. Store your jars in a cool, dark place and use within 12 months. Yields about 2-3 half pint jars. Looks delicious – I had not heard of calcium water before. Since it’s included in the box of pectin, I’m assuming that it helps with the gel?